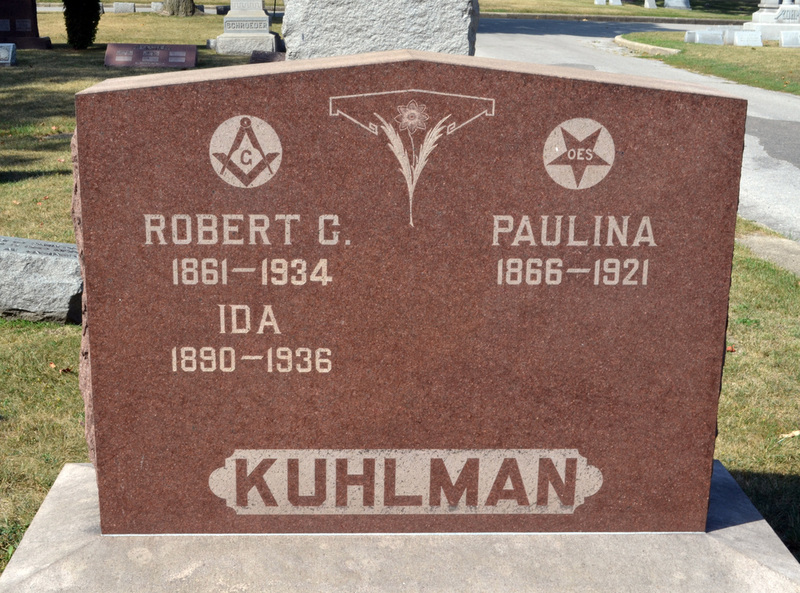 Approximately 40-50% of all Americans belonged to fraternal organizations in the early 1900's, and fraternal emblems are frequently included on monuments. 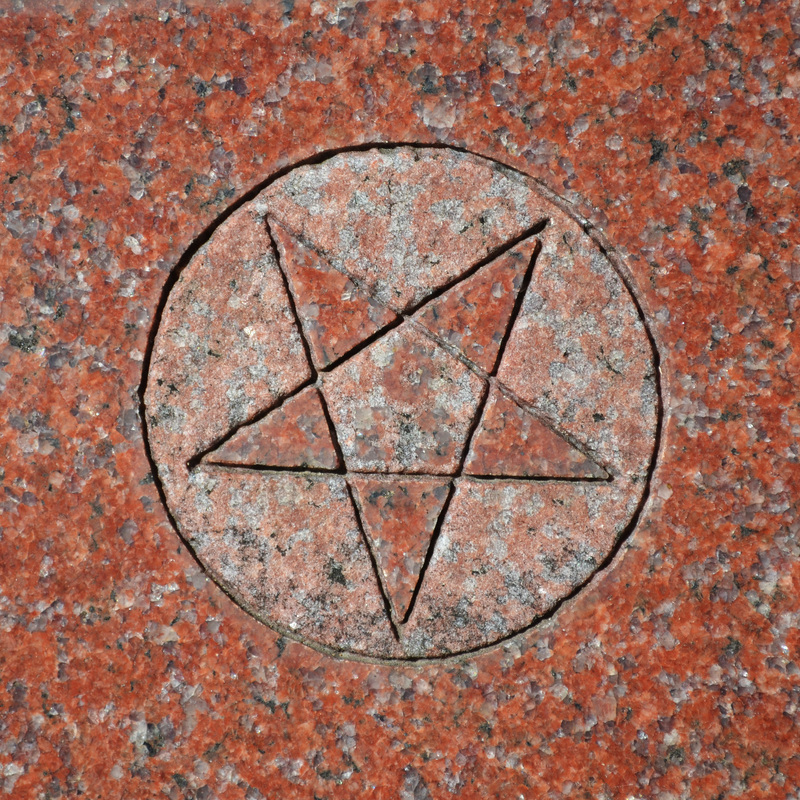 Most common are Masonic and Order of the Eastern Star symbols. 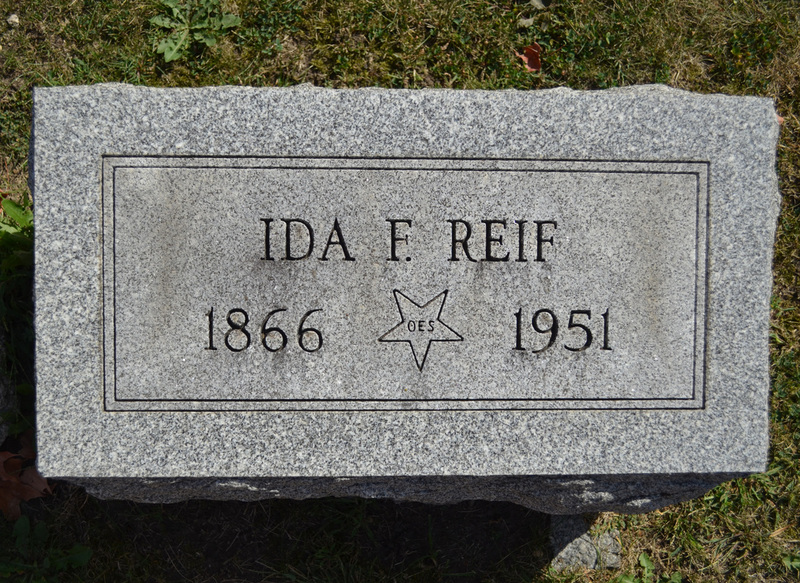 Others include the Odd Fellows Grand Army of the Republic, the Improved Order of Red Men (an offshoot of the Sons of Liberty) and numerous now-defunct, ethnic organizations such as German musical societies. 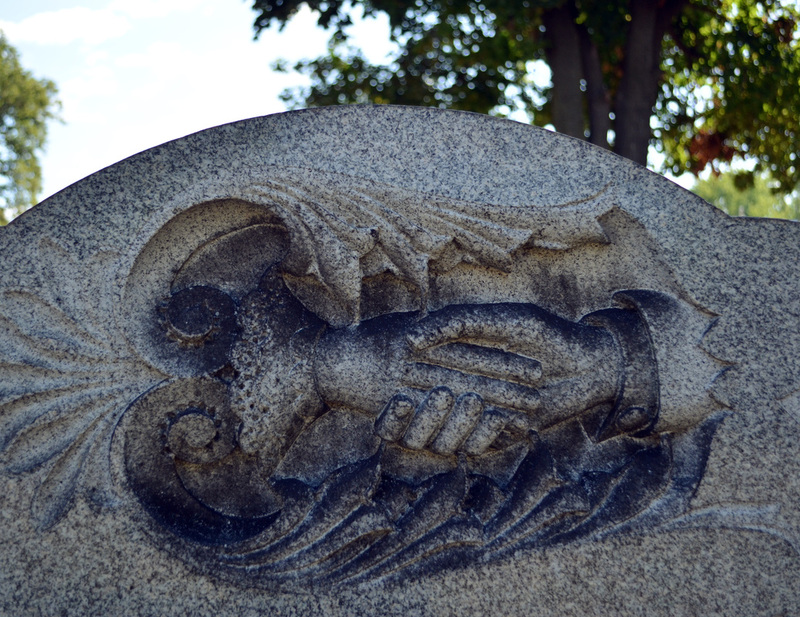 A sheaf of wheat represents harvest, usually found on older peoples' gravestones. 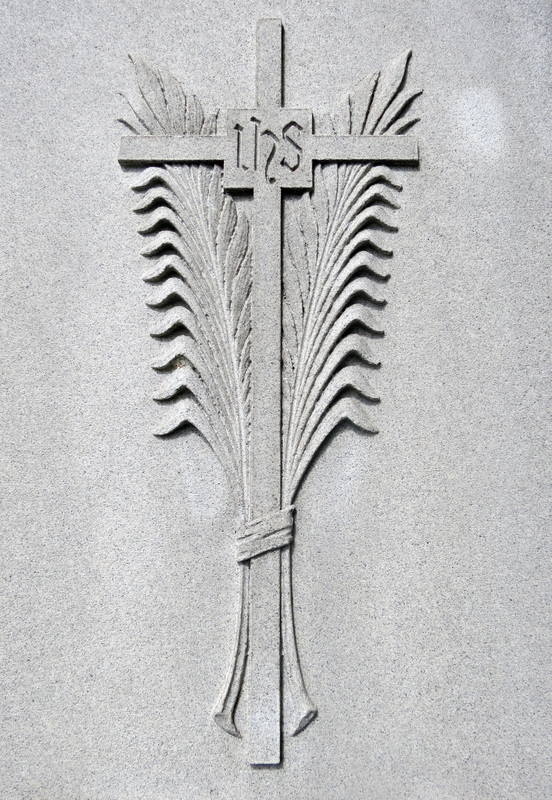 The lamb is the symbol of the Lord, the Good Shepherd. 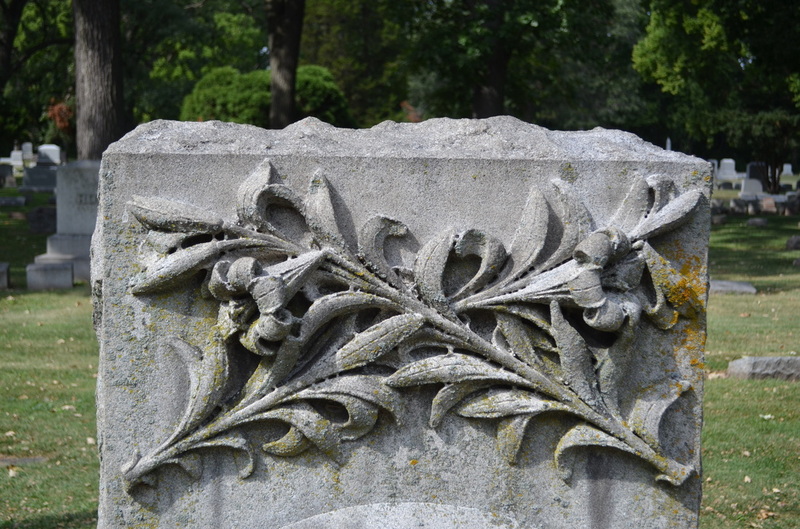 It also represents innocence, likely the reason why this motif usually adorns the tombstones of infants and young children, as in this case. Most often the lamb is lying down, often asleep and sometimes with a cross behind the lamb. 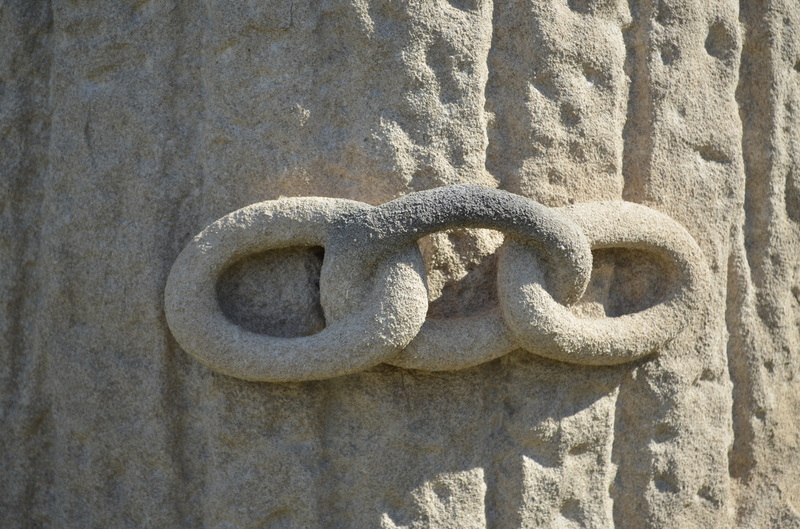 The key symbolizes the key to unlock the gates of heaven (St. Peter), or a learned person or a symbol of knowledge of the scriptures. A lyre is the instrument of Apollo. 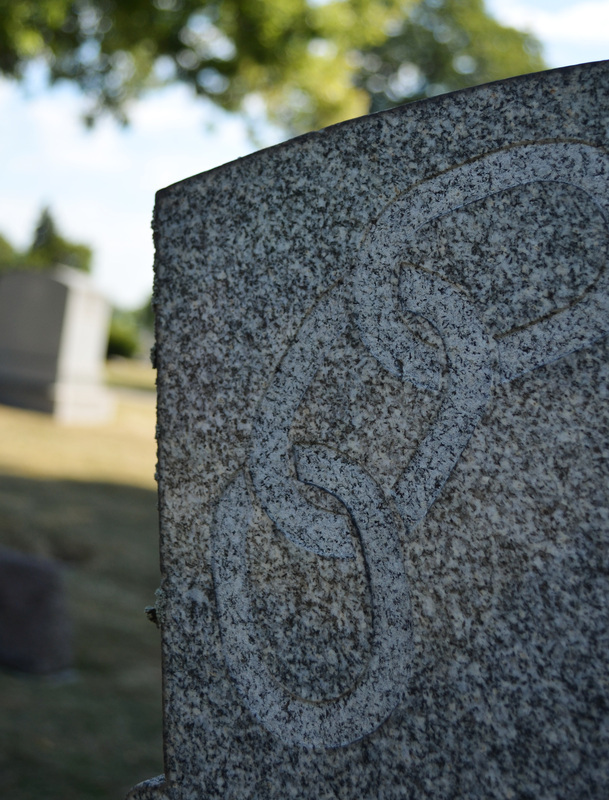 It could also be referencing the harp, which is a symbol of heavenly music, or hopes of heaven. 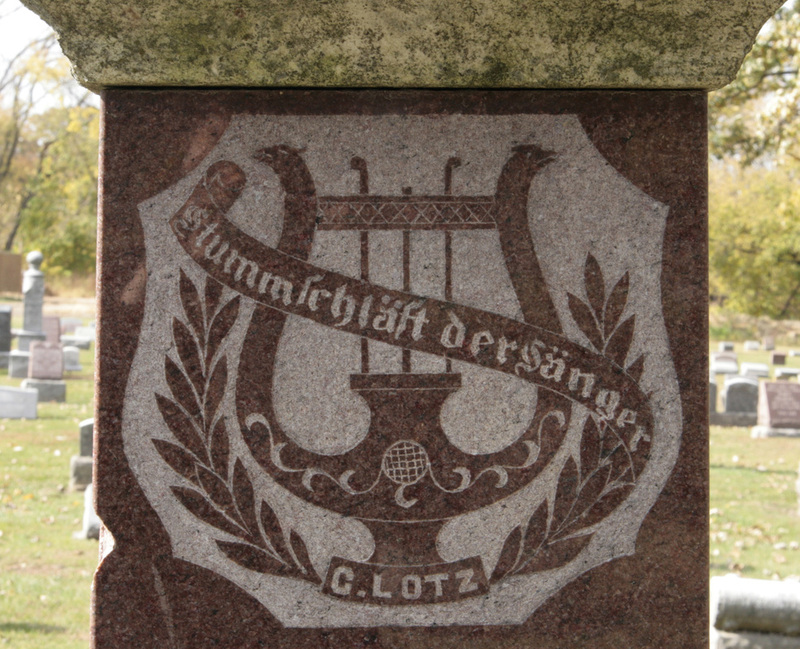 These types of stringed instruments are often seen as the root of divine music. 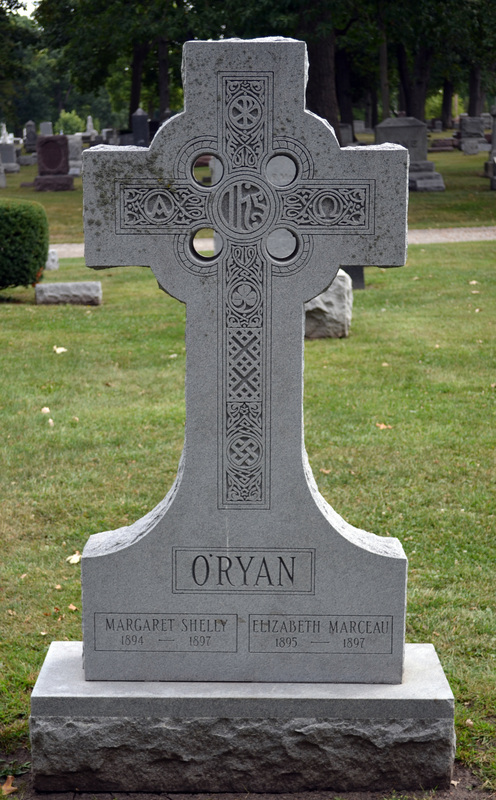 A harp could also indicate someone of Irish heritage. 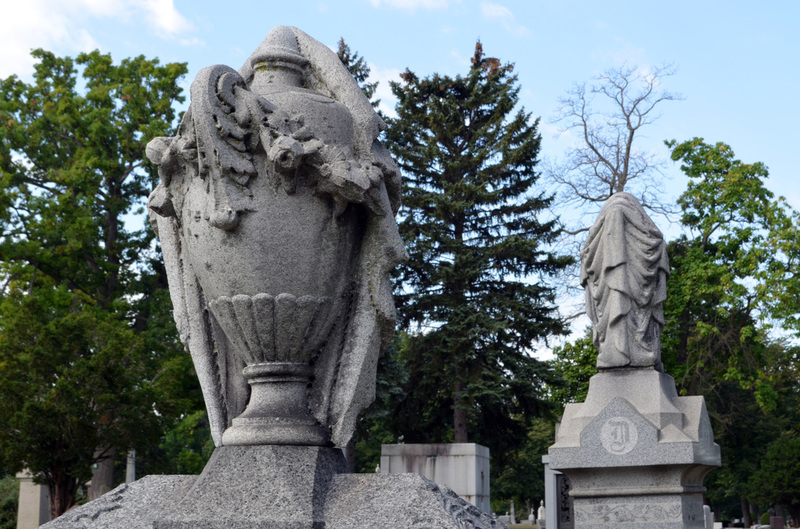 An urn with with Wreath or Crepe is a symbol of mourning. Lilies symbolizes purity and chastity. 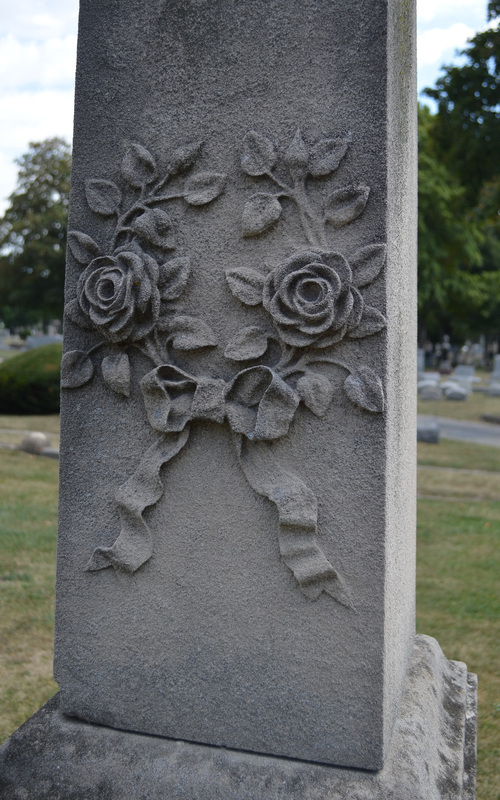 The rose symbolizes love, beauty, victory, triumph, and purity. There is some debate over what "IHS" means. 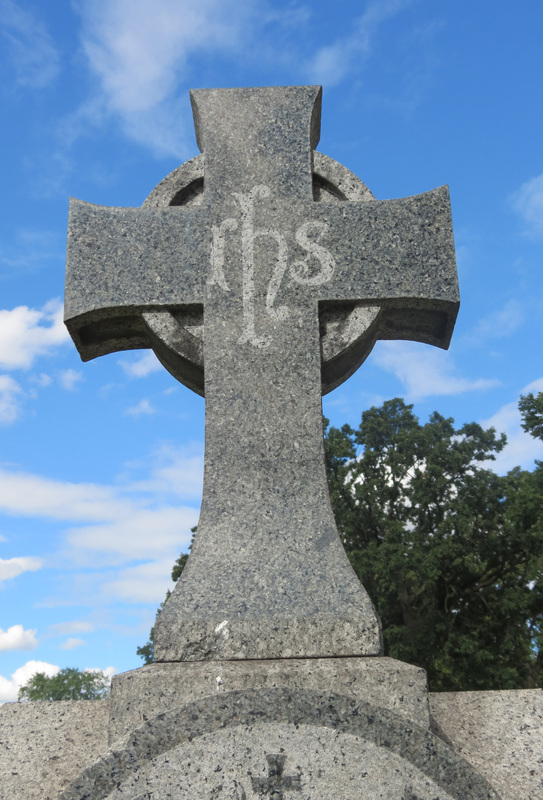 Some believe it is reference to the Latin-speaking Christianity of medieval Western Europe, the most common Christogram became "IHS" or "IHC", denoting the first three letters of the Greek name of Jesus, iota-eta-sigma, or ΙΗΣ. 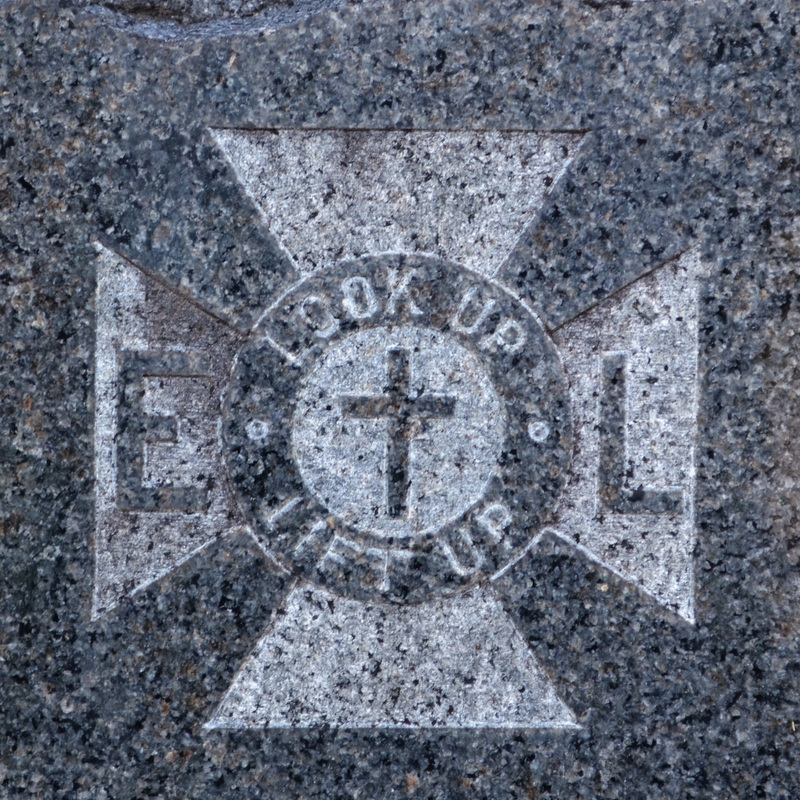 Others believe it refers "in hoc signo", Latin for "by this sign we conquer", referring to the cross. 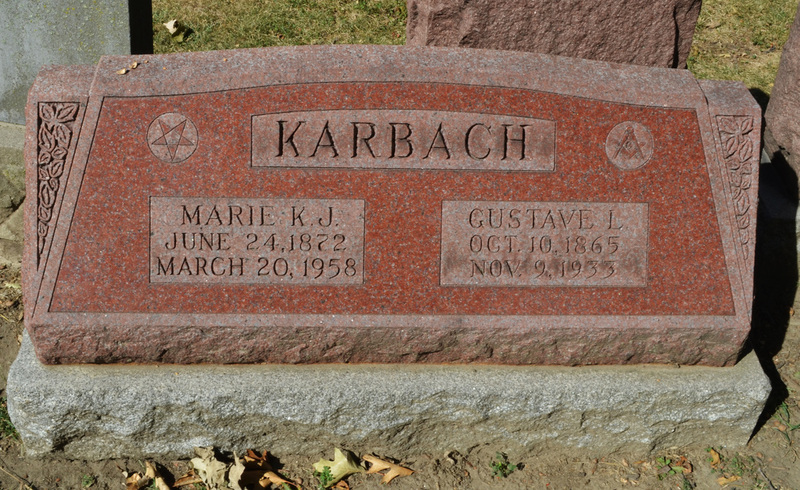 It may also refer to a fraternal organization, Masonic Knights Templar. 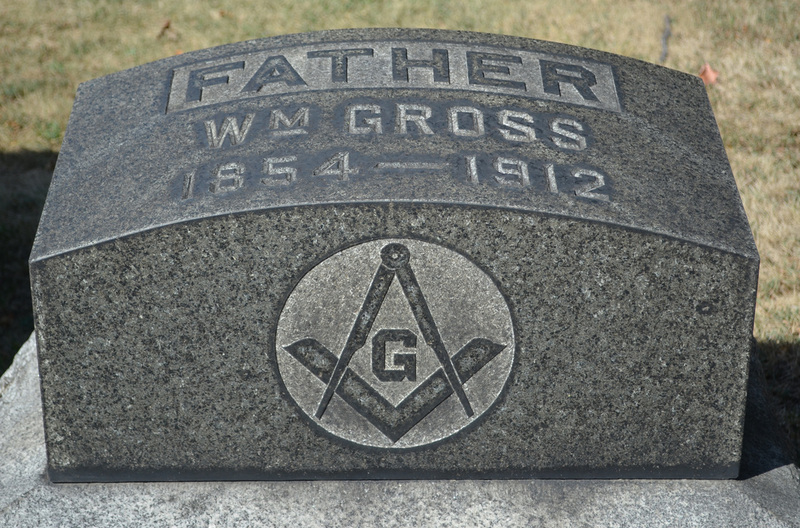 This symbol is of a Masonic Knights Templar symbol showing a cross within a crown inside a Maltese cross, which has the Latin phrase, “in hoc signo vinces.” The phrase means “in this sign you shall conquer” and was used by Constantine as a military motto in the early 4th Century. 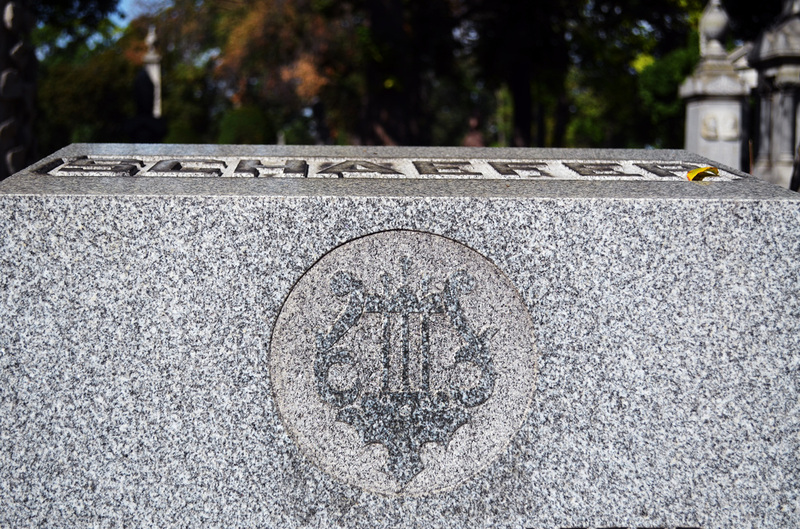 The phrase was also used by the original Knights Templar military order that was founded during the Crusades. 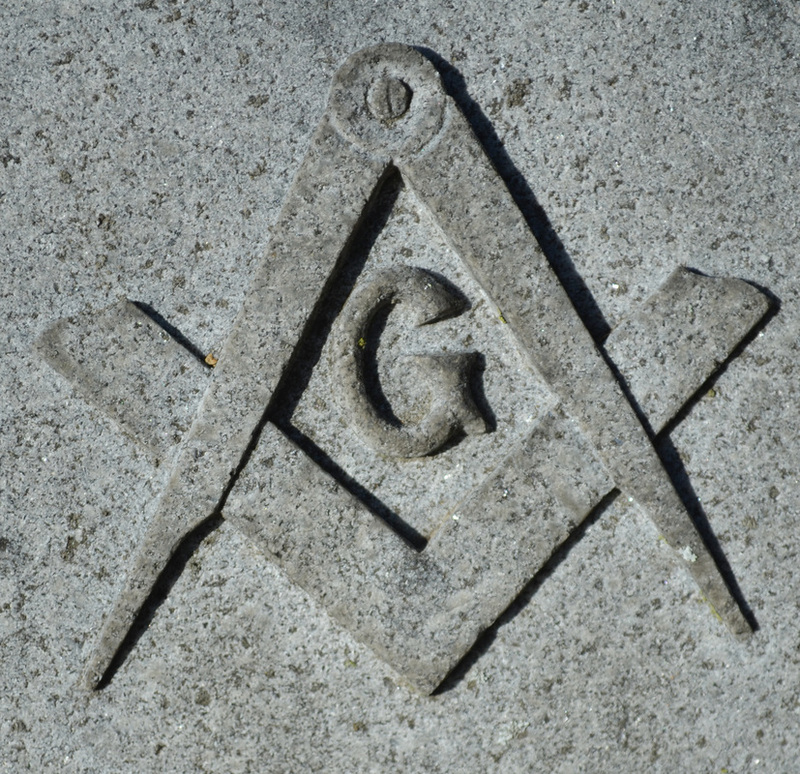 The Freemasons began using Templar rituals and symbols in the late 1700s. 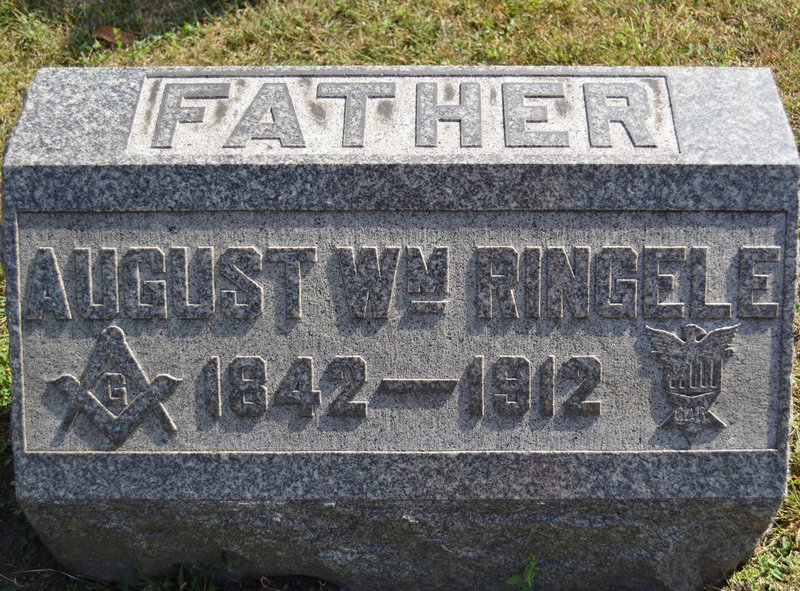 Waldheim was established by a group of German fraternal lodges, who started their own cemetery because Forest Park's Concordia Cemetery would not allow lodge insignias to be displayed on cemetery markers. 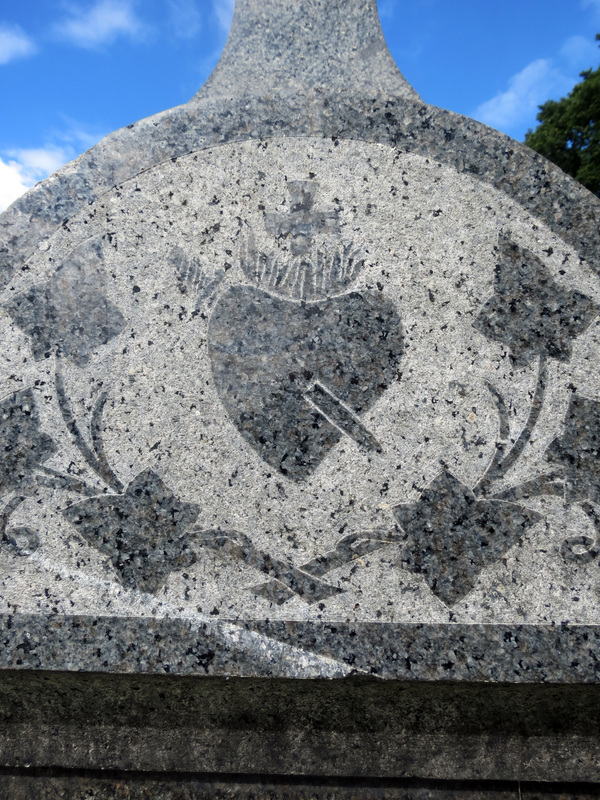 These same lodges purchased Forest Home as a non-sectarian burial ground. 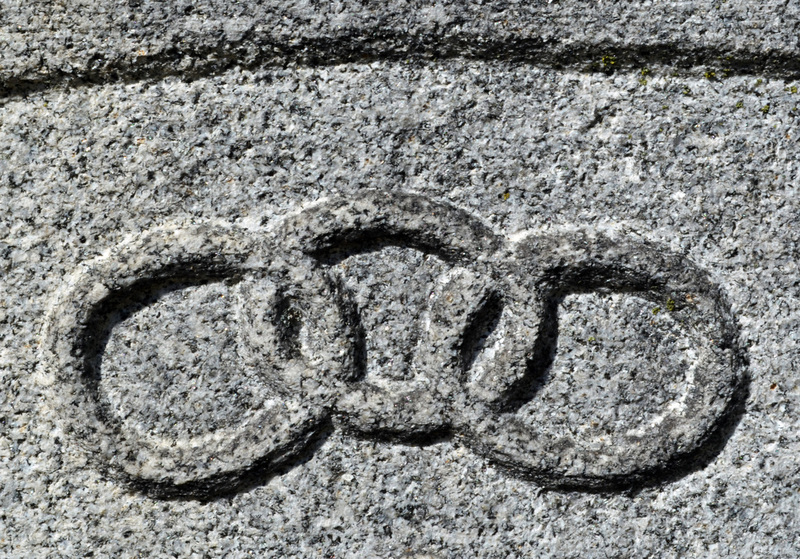 International Order of Odd Fellows known as "The Three Link Fraternity", referring to the Order's "Triple Links" logo - three links contain the letters F, L and T, (Friendship, Love and Truth). 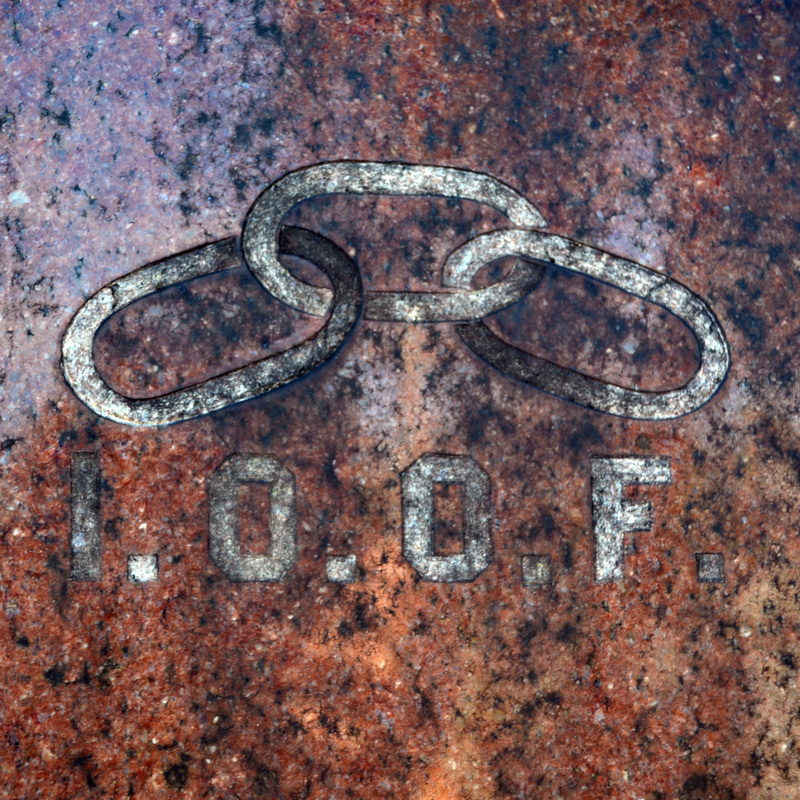 I.O.O.F. 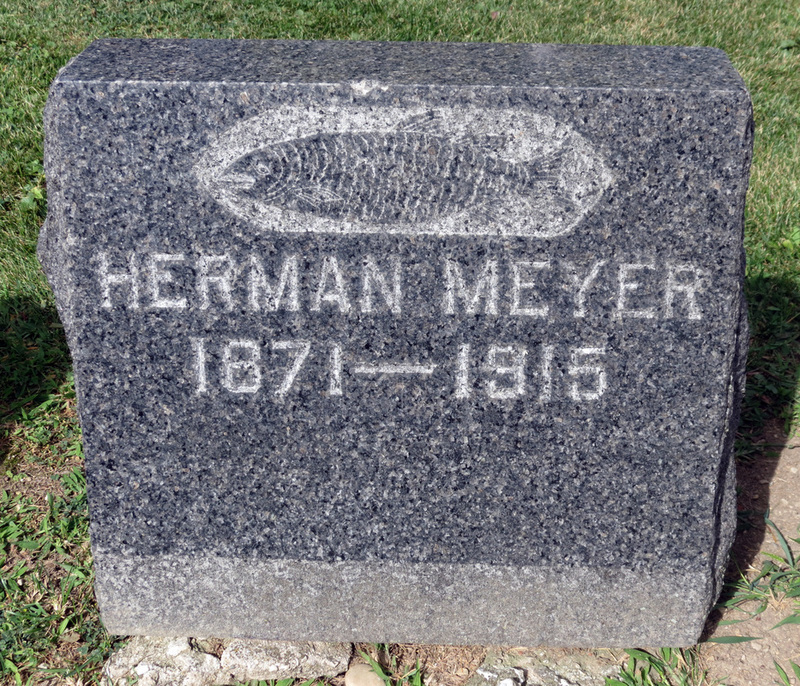 have a large monument in Forest Home Cemetery learn more about it here. 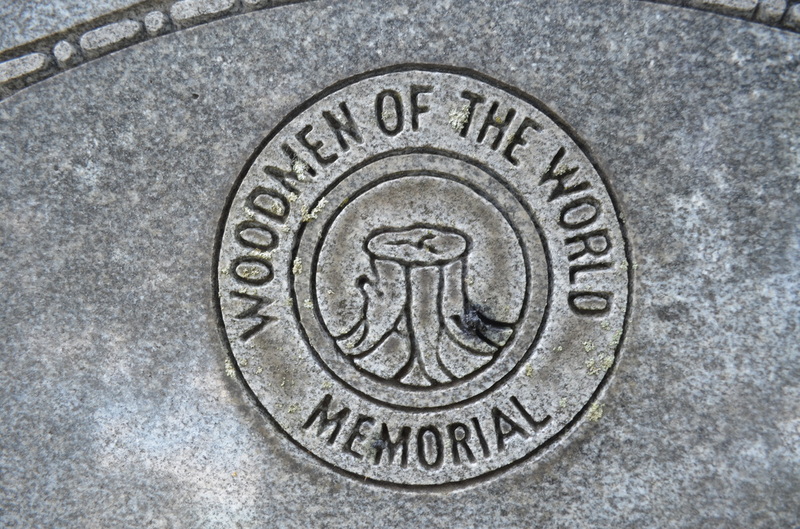 The Woodmen of the World emblem is a sawed-off tree stump, often with a mallet or beetle, an ax, and a wedge: the motto "Dum, Tacet Clamat" (Though Silent He speaks"). 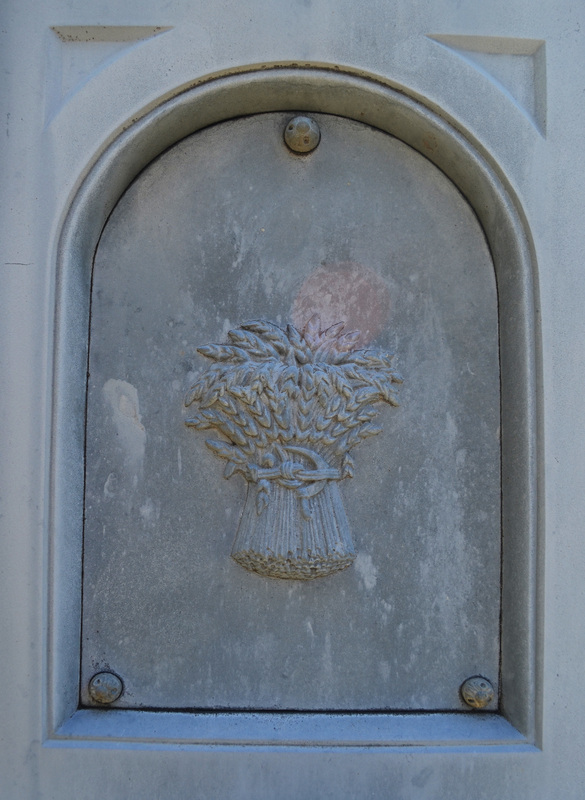 The Woodmen of the World popularized the Rustic Tree Stones style. 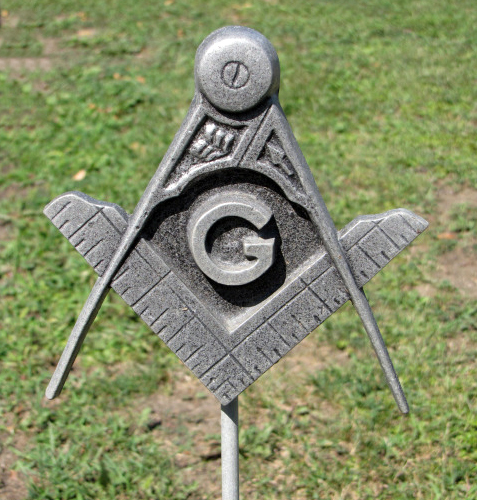 The letter G: This letter represents the initial of God, or the Grand Architect of the Universe, as well as geometry, the basis of Freemasonry’s origins. Uniting the concept of God with geometry is a way of connecting the spiritual world to the physical world. 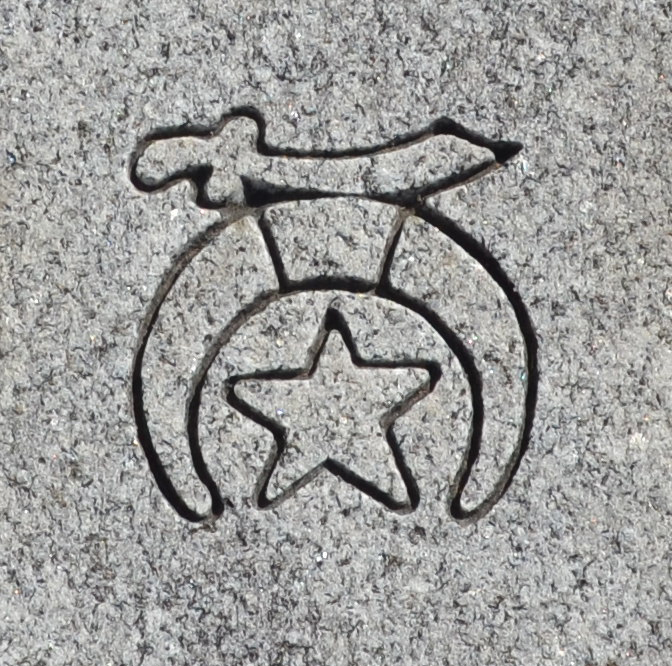 The Order of the Eastern Star is the largest fraternal organization in the world to which both women and men may belong. 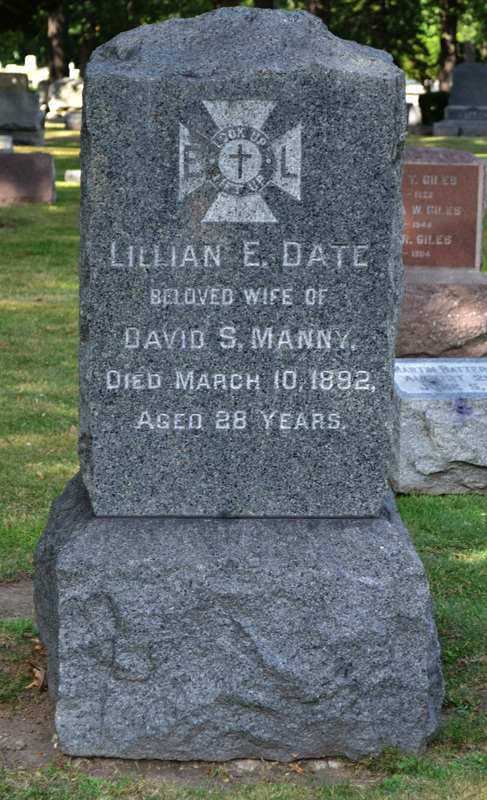 A woman must be related by birth or marriage to a Mason in order to become a member of OES, and a man must be a Mason to join. 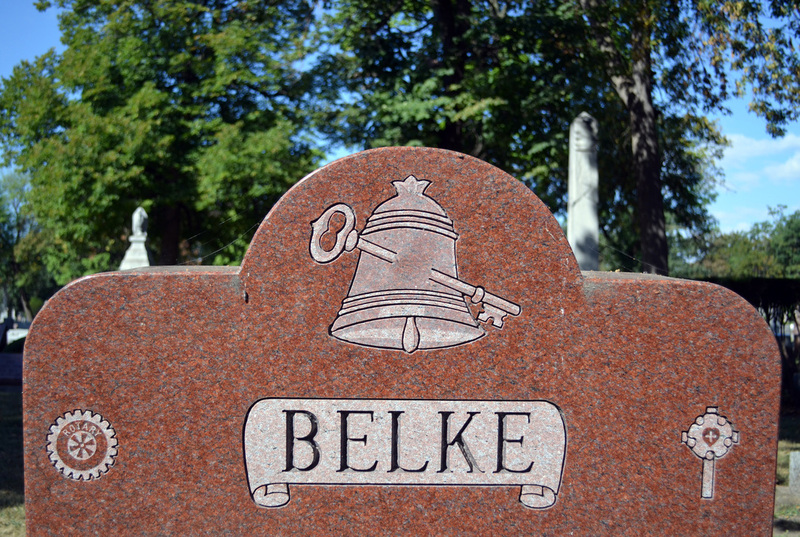 Gravestones frequently have multiple symbols on one stone. 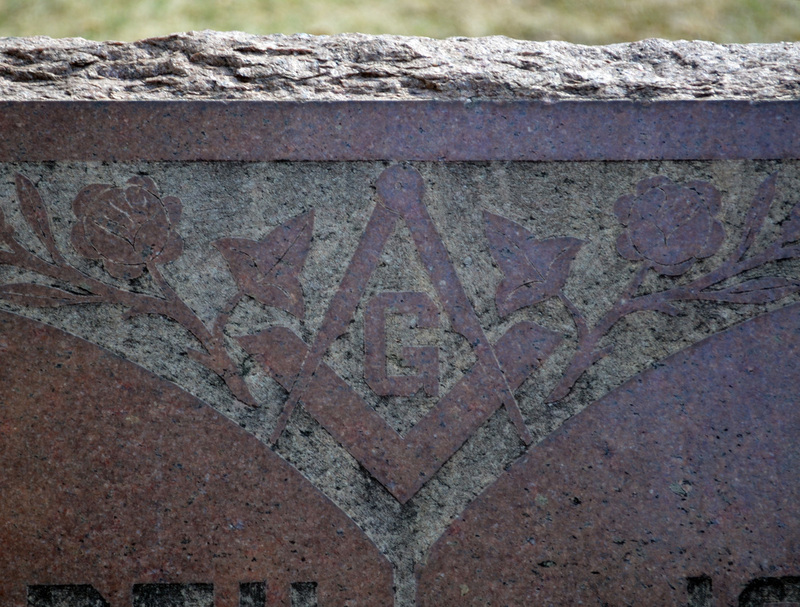 This is especially common with Masons and Order of the Eastern Star. 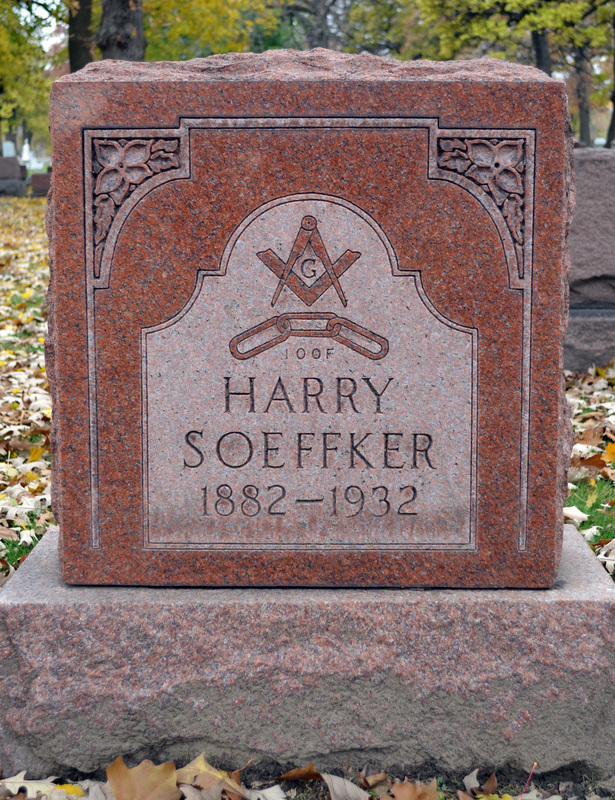 Being a Mason or related to one was required to be in the Order of the Eastern Star. Unlike most organization they allowed women to be members. 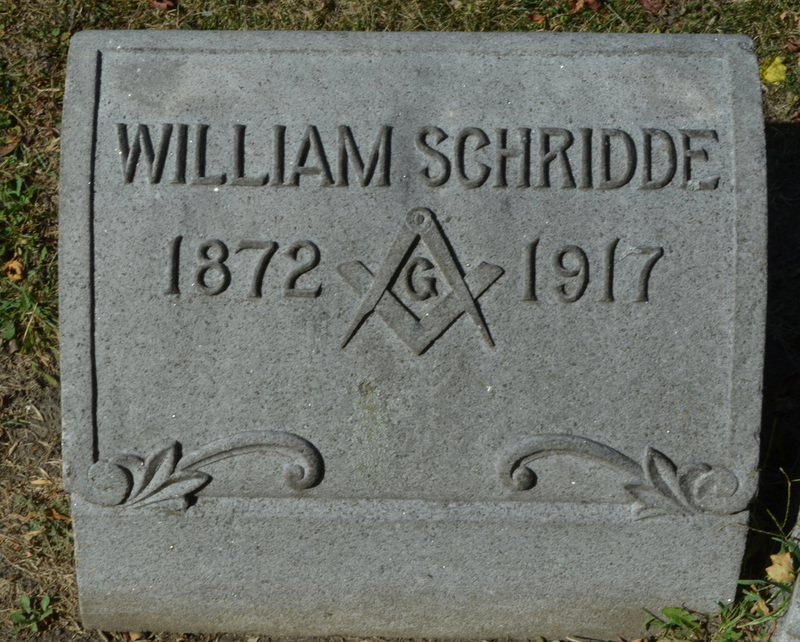 However most fraternal organizations did not allow women to be members. They frequently had woman auxiliary groups. 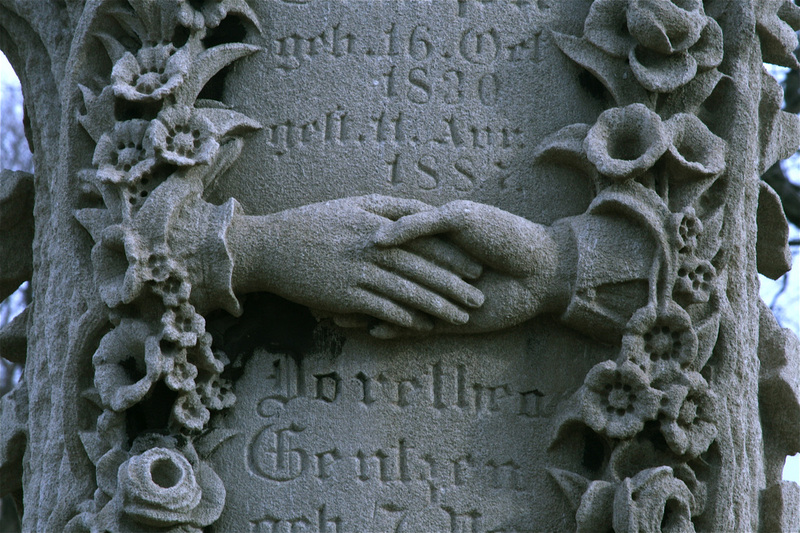 It is common that gravestones shared by husbands and wives had a symbol for both of their organizations. 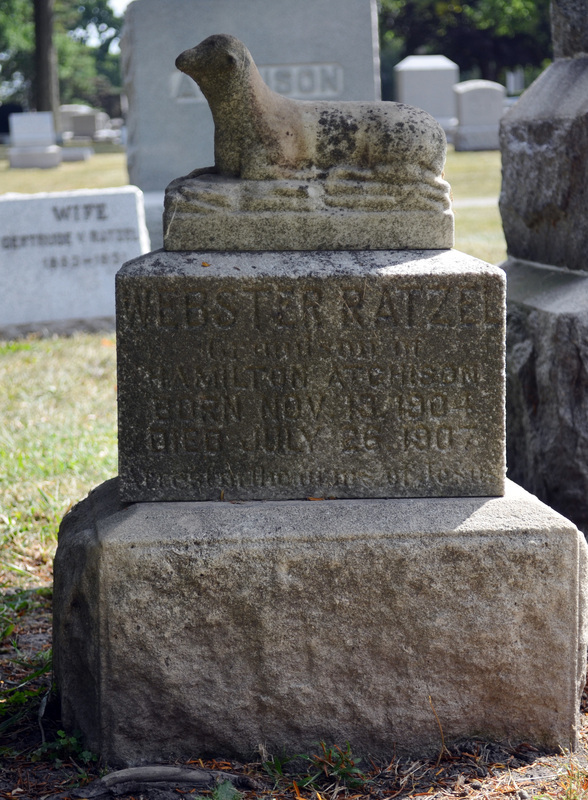 The Ancient Arabic Order of the Nobles of the Mystic Shrine is commonly known as The Shriners. 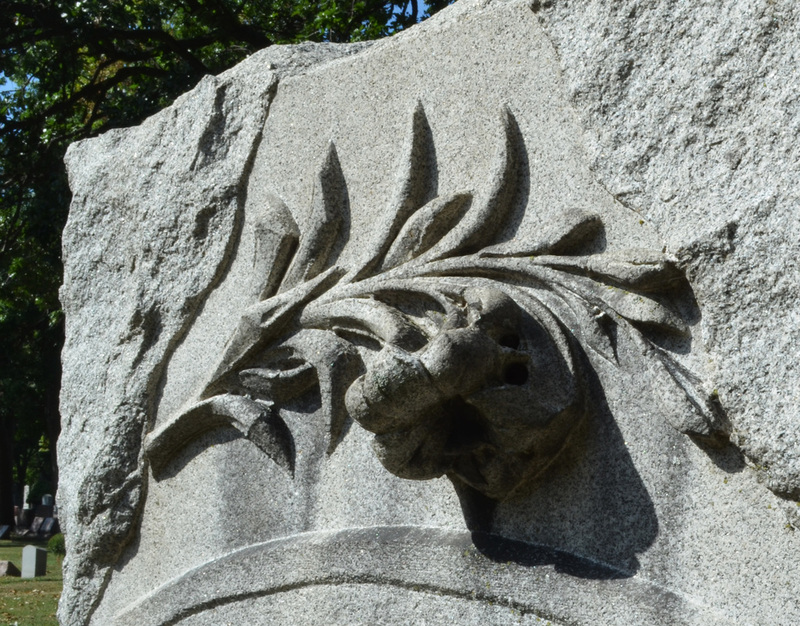 It includes a scimitar (sword with a curved blade), crescent, star of Bethlehem, and/or the head of a sphinx.